This is an incredibly comfortable place to stay. New beds and very clean. Close to everything touristy but in a quiet area. Highly recommend! This is a very chill, clean, and safe hostel. Our room had a safe, and was extremely clean! Staff was friendly and helpful. This was an excellent place to stay! An easy 5/10 min walk to the centre, large room, really hot showers woth the best pressure we've had so far. The staff were really friendly and helpful. Not a great place to meet other travellers but a brilliant base before or after a trek to relax. Had a great stay, however, the night we stayed here the water went out multiple times. I am used to traveling and it wasn't too big of a deal but was definitely inconvenient for my family. Other than that though, the hotel and staff were very nice. Great place to get acclimated to the elevation. Hot showers with great water pressure. Wifi was really fast. 10 min walk to the main square. They didn’t sell water so bring your own. Overall a very pleasant stay for a few nights. The hostel was clean, nice and confortable. The only con was that we got scammed by the tour agency provided by the hostel. Just make sure you book your tours elsewehere. 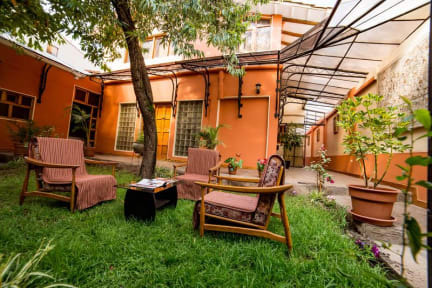 The location was great, about a 10 minute walk from the heart of Cusco. The facilities are clean and the beds are comfortable, they can also store your items during overnight trips. While they accept payment by credit card, the machine was broken so be prepared to pay in cash. Staff wasn't experienced with HostleWorld, and it took a very long time to explain I had already paid a deposit and owed less than the original total per the confirmation email. Its a bit far from the center and the atmosphere is quiet and lonely. The staff is nice but a bit slow. Good if looking for quietness but also a bit expensive, could find other options in the area. Good point is that they gave me a heater for free, at night it was necessary. Rented a room. Nobody was at the door to let me check in for multiple hours. Called from another location, and they said they needed 10 minutes to figure it out and then hung up on me after 2-3 minutes.